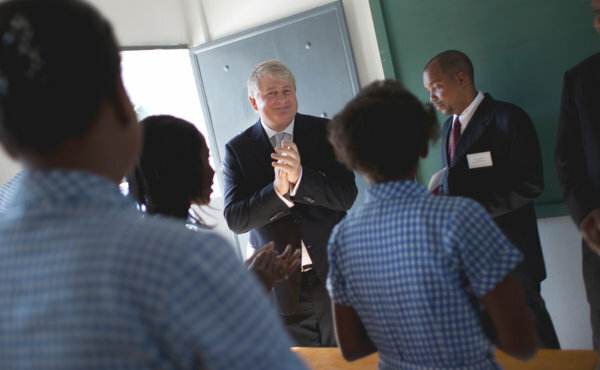 Denis O’Brien, chairman of the cellphone company Digicel, during a visit to a Port-au-Prince school built by his foundation. PORT-AU-PRINCE, Haiti — Almost two years after an earthquake ravaged this city, some half a million people are still living in filthy tents, cholera has infected a similar number across the country and the president works from a flimsy prefab structure behind the still crumpled Presidential Palace. A woman carried plastic flowers near the Marché Hyppolite, which was rebuilt by the Digicel Foundation. Denis O’Brien at a Clinton Global Initiative meeting. Denis O’Brien, an impatient Irish billionaire who tends to make his points with a few choice profanities, is determined to change all that. On a recent sunny morning, he presided over the opening of the 50th school that his vast telecommunications company, Digicel, has rebuilt since the quake struck in 2010 — and then he promptly pledged to build another 80 schools by 2014. His intention is not, however, to be a one-man force for change. With a skill for what he calls “frying feet,” he has sweet-talked, cajoled, harangued, nagged, strong-armed and shamed government officials, international financiers and business leaders into doing more to rebuild Haiti. In the process, he has become de facto ambassador for an emerging business-centered approach to the redevelopment of this disaster-prone nation, which has so long relied on the work of nonprofit groups and aid agencies that it is known as the Republic of N.G.O.’s, or nongovernmental organizations. Digicel, on the other hand, is the country’s largest employer and taxpayer. The privately held company has invested $600 million in Haiti, making it by far the country’s largest foreign investor ever, and it has democratized communications with its strategy of selling low-price cellphones and services to the masses. Mr. O’Brien has profited extensively from Haiti, which is Digicel’s largest market and accounts for roughly one-third of its 11.1 million subscribers. Thus, Digicel unveiled plans in November to invest $45 million in a new 173-room hotel next door to its offices, to be run by Marriott. That announcement came at a forum sponsored by the Inter-American Development Bank that drew 500 business people from 29 countries. It was kicked off by a ribbon-cutting at a new industrial park in Caracol whose first tenant will be Sae-A, a Korean apparel manufacturer with extensive experience in Latin America. It is building a plant that plans to employ 20,000 and, unlike the low-wage apparel manufacturing operations that spawned vast urban slums, incorporate housing developments and other infrastructure. Just last month, Heineken, the Dutch brewing concern, increased to 95 percent from 23 percent its stake in Brasserie Nationale d’Haiti, a Haitian brewery and bottler, saying it saw greater political and economic stability in the country. Then there are commitments from the 60-odd members of the Haiti Action Network of the Clinton Global Initiative, or C.G.I., which include installing solar panels, increasing energy supplies, refurbishing homes and providing job training. Mr. O’Brien is charged with overseeing their progress on behalf of former President Bill Clinton, and so after the school opening, he headed to the Hotel Montana to grill the network’s members, as he does 10 times a year. They are the kind of questions Josefa Raymond Gauthier knows well. In charge of the agency that finances a variety of government projects financed primarily by international donors, Mrs. Gauthier was the first chief executive of the Digicel Haiti Foundation, which oversees the construction of the schools. “I arrived at the foundation in late 2008, and all of a sudden it was, ‘We have to deliver a school by March because Denis O’Brien is coming,’ ” Mrs. Gauthier said. The foundation quickly realized, however, that simply putting up a school was not the answer. “Teachers are a catastrophe,” Mrs. Gauthier said. So Digicel began remedial teacher training and paying teachers when the Ministry of Education was late or checks went missing. And then there were textbooks and desks and myriad other things. As a young man, Mr. O’Brien thought he would make his fortune replicating the Home Shopping Network in Ireland, but instead he nearly went bankrupt, saving his investors and himself with the do-or-die purchase of an Irish radio station that became part of what is now the Communicorp Group. He then established Esat Telecom in 1990, eventually buying Ireland’s second mobile phone license — and igniting speculations that political favor had played a role in the bidding. Amid the storm, Mr. O’Brien sold Esat in 2000, leaving him at 41 with a few hundred million in the bank and “bored out of my mind.” He saw an ad for the sale of a mobile license in Jamaica, picked up a phone in a Dublin pub, bid $47.5 million and won, opening the door to a telecom enterprise spanning the Caribbean and South Pacific. Forbes magazine ranks him 254th on its list of the world’s billionaires, with an estimated $4.2 billion. He walks a fine line in Haiti, where his take-charge manner and ability to push projects forward highlight government ineffectuality and weakness. Digicel, for instance, has put up street signs in parts of Port-au-Prince, serving as reminders of the company’s role in public life as much as guides for navigating the city. Most mornings, people crowd around the reception desk of Digicel’s office building, not to complain about the firm’s services but to see the mayor and other city officials whose offices are on the sixth floor since the earthquake. The company provides the space rent-free, Mayor Jean-Yves Jason said, and gave the city computers and furniture. “We have plans to build a new city hall in downtown Port-au-Prince, but we are so comfortable here it is easy to delay,” Mr. Jason joked. The mayor conceded that the arrangement has left the city vulnerable to charges of conflicts of interest and favoritism. Mr. Jason said, for example, he was having trouble getting another Haitian telecom company to pay its taxes. “We can’t really go after them publicly, though, because they are going to claim we’re aligned with Digicel, their competitor.” Mr. Jason said the city could not have functioned without Digicel’s help in the early days after the earthquake. The company prepaid its taxes, which allowed the city to make its payroll and other payments, and paid for dump trucks and tractors that were used to remove rubble and clear spaces. Digicel does not always get its way. It would like, for instance, to increase its role in the redevelopment of downtown Port-au-Prince around the iconic Iron Market, which Mr. O’Brien rebuilt with $16.5 million of his own money after the earthquake. But so far, he has been unable to get the necessary government approvals to move forward and redevelop parts of downtown. “We’re getting the slow no,” he said. There are other challenges. In an interview in New York after attending the Clinton Global Initiative’s meeting in September, Mr. O’Brien spoke enthusiastically about plans by Haiti’s president, Michel Martelly, to finance his program to provide free primary school education to all Haitian children with fees on cellphone calls and remittances. Mr. O’Brien said that despite opposition from his senior management, who knew the charges would be unpopular with customers, he regarded them as an innovative means of raising needed revenue and a promising sign of government resolve. Copyright 2012 The New York Times. Reprinted from The New York Times, International, of Saturday 7, 2012.